Wanting the bar to live on in posterity, and fearing the fragile oral culture of his country, the bar owner has Broken Glass write down stories of the regulars, so that the bar’s fame will endure long after the last glass of cheap red has been served. A couple of years back, I read Black Bazaar, an entertaining book about Africans in Paris, but Broken Glass takes us back to the writer’s roots, showing us where the characters of Black Bazaar started – and where they might return one day. Mabanckou is an excellent writer with a formidable style, here creating a sweeping text devoid of full stops, a flow of words which stretches across chapters. The novel is incredibly funny in places, even if, for some people, the humour might be a little too earthy (not to say cruel…). Although I enjoyed the stories, I gradually became a little wary of Mabanckou’s intentions. The first two tales told by customers end in disaster, both men betrayed by the women in their life. By the middle of the book, there’s a sense of a real gender battle, with women being the root of all evil, the bane of the poor men’s existence, their jealous actions bringing true suffering in their wake. 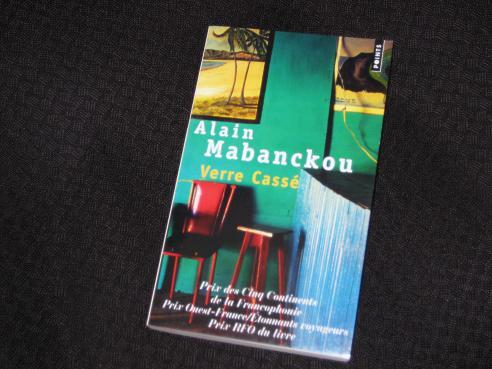 The reader (or this reader, at least) begins to wonder just where Mabanckou is going with this.